Knockfarrel is a picturesque Iron Age hillfort outside of Dingwall. It occupies a substantial area, with spectacular views in all directions. The remains of walls are clearly visible, and are thought to have held a timber rampart when the fort was occupied. 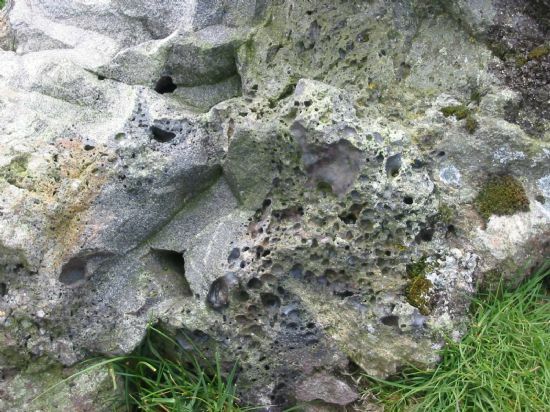 Knockfarrel is noted for its extensive vitrification – rocks which have melted a some point due to intense heat, probably more than 1,000 degrees Celsius. Many hillforts in the Highlands, especially around the Moray Firth area, show signs of vitrification. The stones show bubbling on their surface, or a glassy sheen. At Knockfarrel there is also evidence of casts of former timber preserved in the vitrified stonework. The reasons behind vitrification have been much debated. Some people have thought that the walls were deliberately fired to provide a seal to the wooden rampart or palisade constructions, though others have argued that this would merely have created brittle joins. The more currently favoured explanation is that vitrification resulted after deliberate firings of conquered hillforts by the victors. The main problems with all these theories is that experimental archaeology has shown it is very difficult to sustain the hot temperatures needed to create vitrification on a large scale. Knockfarrel is also noteworthy for being one of the earliest recorded excavations in Scotland. In 1777 John Williams cut three trenches across the site, all still clearly visible. He recorded finding a rubble core 12 feet high on the north side, and ruins of buildings on the inner faces of the walls. None of these survive today. Despite the large area enclosed, there is no evidence of a well, though the central area of the site is a boggy sump and may well have been used to retain water. However, Williams reported excavating two wells within the interior which he said filled overnight with water. As a result there are many unanswered questions about the site. Did people live there, and who were they? What was the nature of the settlement? And why was it destroyed? ARCH will provide a guided tour of this site on Sunday 19th of September at 2pm as our contribution to Scottish Archaeology Month. For details on how to drive to the site or to walk up from Strathpeffer, contact the ARCH office. Boyle, Steve. Notes from the Hill-fort Studies Group Spring Meeting, May 1997.